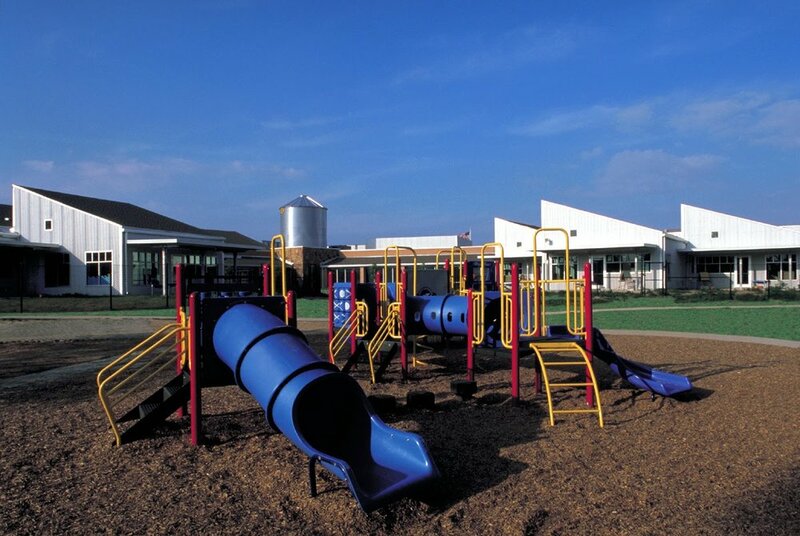 The Ann Windle School for Young Children was the first dedicated child care center to serve the early childhood development needs of the Denton Independent School District, and is an integral part of the district's Head Start program for preschoolers. th+a architects worked closely with the teachers, administrators and faculty representatives throughout the design process to develop a very unique plan to house this large program. The design is based upon providing a village atmosphere, using pods of three to four classrooms to group the learning areas in response to functional requirements and to help reduce the scale of the center appropriately for its young users. The building exhibits a rural influence, using a metal silo as a focal point for the structure located at the heart of the building from which the three primary wings extend. The aesthetic is further enhanced by the use of corrugated metal siding, local stone, and metal shed roofs reminiscent of the barns and out-buildings of North Texas farms and ranches.